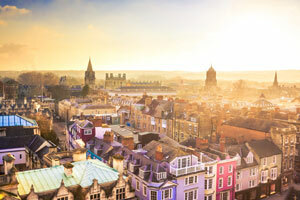 Oxford, located in the South East of England just 60 miles from London, is a truly unique destination of rural beauty, renowned for its world-class business clusters including bioscience, scientific research and cryogenics. But did you know, there are plans for further development with a further four innovation centres being built? The Oxford Science Vale, Oxfordshire’s science and technology heart, is larger than that of Cambridge and, indeed, larger than that of MIT in the USA. Oxfordshire has the largest concentration of research and development activity in Western Europe, and in total the Science Vale area contains 13% of all research and development employment in the south east. For example, within the Science Vale, Culham is home to the UK’s fusion research programme – the Culham Centre for Fusion Energy (CCFE) – as well as the world’s largest fusion experimental facility – the Joint European Torus (JET). Milton Park is one of Europe’s largest multi-use business parks and is home to more than 160 companies that form one of the UK’s foremost science communities. Oxfordshire is part of the UK’s Golden Triangle. This triangle is formed by the University of Oxford, The University of Cambridge and the Universities in London (including Imperial College London and Kings College London). The Universities within the ‘Golden Triangle’ –have a combined annual research income of over 1.4bn. As part of the Science Vale, the Harwell Campus is being developed as a world-class centre for science, innovation and enterprise. Home to the Science and Technology Facilities Council, the Rutherford Appleton Laboratory, the Medical Research Council and the European Space Agency Space Centre, Harwell has more than 4,500 people working in over 140 organisations comprising large-scale research councils, high technology companies and a range of rapidly growing start-ups. MRC Harwell is at the international forefront of the use of mouse genetics to study the relationship between genes and disease. Diamond Light Source at the National Synchrotron Science Facility is a research centre of global importance. This has several applications in the life sciences, in particular it enables a detailed understanding of drug structures and has application in the characterisation of materials for medical devices and drug delivery technologies. The UK’s most powerful supercomputer, Emerald is located at the Rutherford Appleton Laboratory, which allows companies to access for many different applications including bioinformatics and developing new tools for processing medical images. Four new innovation centres are being built including two in Oxford, the Oxford BioEscalator will focus on nurturing new bioscience companies and the Begbroke Accelerator is planned to be completed summer 2016 it will offer mixed space flexible space for offices and wet/dry laboratories. Also one each at Harwell and Culham. Cryogenics is biological material for healthcare research, such as stem cells, that requires specialist cold storage equipment. A world leading triangle of research laboratories, academia and industry, including Clarendon Laboratory, Oxford Instruments and Rutherford Laboratory bought the world’s first MRI scanners and the most successful cryrocooler technology flown in space. An exceptional concentration of this enabling technology has evolved around Oxford, currently 30 organisations in Oxfordshire are engaged directly in cryogenics accounting for over 1000 employees and £1billion economic activity. This is unmatched anywhere else in the world, which has resulted in sought after specialists at all levels. Oxfordshire is the most rural county in the South East. It has a population of around 666,100, one third of which lives in towns or villages of less than 10,000 people. The county is a popular visitor destination for its rural beauty, numerous market towns and Oxford city itself, which has earned a global reputation for its academic and architectural splendour. Oxford is also a global centre of publishing. Oxfordshire has consistently high levels of employment and the workforce is amongst the most highly-qualified in the country. World-class business clusters include bioscience, advanced motorsport engineering, scientific research and cryogenics.